Thursday is gallery night in San Francisco; Gail and I went off to the RayKo Photo Center for an opening of their alternative landscape show. I liked some, I hated some. That’s art. People watching at a gallery is always interesting–real artists, wannabe artists, poseurs, collectors, connoisseurs, people of all stripe show up to see the art and each other. After the art, we went to dinner. Gail hauled out the Guide Michelin, and found COCO500 just a couple of blocks away, at 500 Brannan Street on the corner of 4th. loretta keller’s south of market hot spot brings in the crowds to enjoy its warm, modern vibe and bold, stimulating flavors. COCO5OO’s commitment to high quality, small production ingredients begins in the kitchen, extends through the wine list, and forms the foundation of the bar program. chocolate, blue, and caramel toned walls of new and century old douglass fir set the mood in this 1906 wood structure. a generous bar of rich teak and blue italian glass tile welcomes those looking to relax and enjoy a cocktail, glass of wine, appetizers, or an entire meal. Here’s what we say: it was good. Gail started with an incredible Cauliflower soup–it had both cream and chicken stock, so this restaurant doesn’t sacrifice flavor on the altar of politically correct vegetarianism. I’ve never enjoyed such a strong, earthy flavor in a soup before–it was like the vegetable had just come out of the ground. 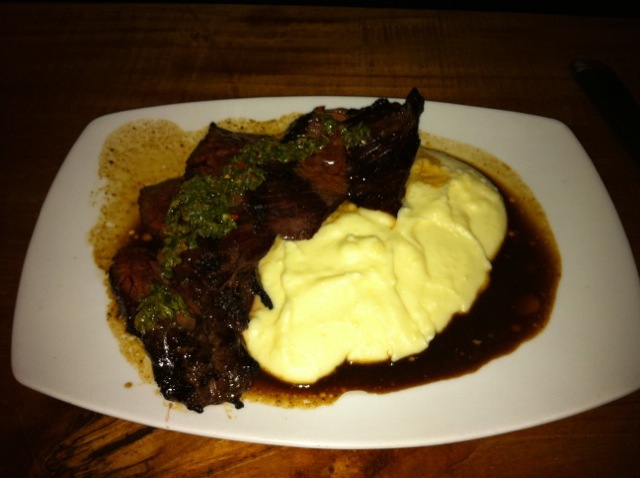 She followed with the Hangar steak, served in a sea of perfectly mashed spuds. How can anyone not like mashed potatoes? The medium rare steak was perfect in parts, but suffered from too much inedible gristle in other sections. The portion was exceptionally generous, so even with the gristly parts there was plenty to enjoy. I started with the California Burrata. Its interesting to me to watch trends develop and new products take their place in the market. A year ago I’d never heard of Burrata, which is a fresh Mozzarella injected with fresh cream. Now I’m an addict, searching it out on menus all over town. Where it was originally only available as an import, it is now being produced in great quality here in California. Lucky me. This salad was a goodly portion of the cheese served on toasted french bread with a salad of greens and fennel, topped with olive oil. 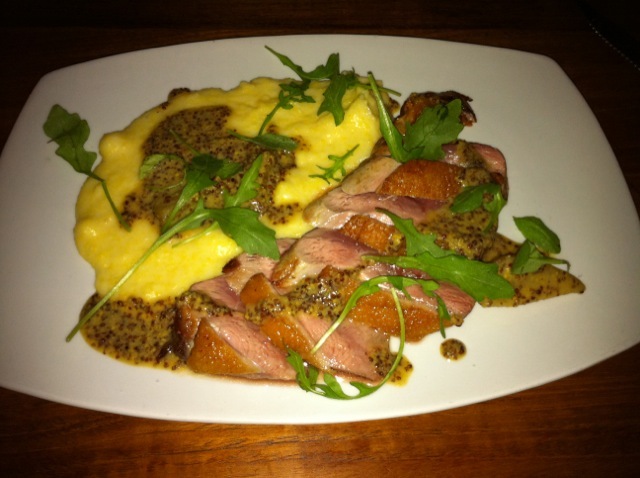 My main course was the duck breast, where “medium rare” means mostly raw in the center. That’s the way they serve duck in the good places, and who am I to argue? It was served with polenta, which was dressed with a mostardo, which I had to inquire about. Mostardo turns out to be fruit preserved in mustard–in this case wonderful crisp peaches, in a sauce of mustard, honey and balsamic vinegar. It is exceptionally piquant, and brings a unique vitality to the normally bland polenta. COCO500 is fairly noisy, which I guess you should expect in a hip joint Elegant Touch Catering to the SOMA in-crowd. The service was professional without being obsequious, and our dinner, with one glass of wine, completely chewed up a C-note, which is about the norm these days. We liked it, and we’d go back. Give it a shot.